Thanks to television, the images of the past week have been ingrained into the memory of every American: planes crashing into the twin towers of the World Trade Center in New York City and into the Pentagon in Washington, D.C.; debris and dust engulfing lower Manhatten; and the collapse of two skyscrapers that helped define the New York skyline. 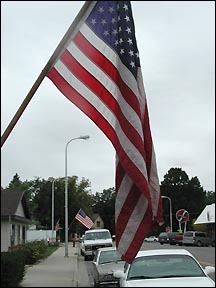 James Street was only one place where the American flag was proudly displayed last week. John Jedlicka, a 1988 PHS graduate, had a bird's eye view of the terrorist attack in New York City on Tuesday, Sept. 11. Jedlicka, who has lived in New York City off and on for nine years, works in the World Financial Center, across the street from the World Trade Center, as an investment banker for Lehman Brothers/American Express. Jedlicka and his coworkers first rushed to the window to see the north tower in flames and then rushed downstairs and outside to watch. "Nobody knew what was happening," said Jedlicka. "We heard a plane had hit the building." Because cell phones were out, Jedlicka went into the lobby of his building to use a pay phone. "I heard people on the harbor side screaming," he explained. "They could see the second plane coming in." Many people, especially those who had been through it in 1993, left work and went home. Before heading home himself, Jedlicka saw four people fall from the World Trade Center, a gruesome sight he says he will never forget. All the windows in Jedlicka's building are broken, and it has suffered structural damage from the fires and is in danger of collapsing. Jedlicka considers himself lucky to have escaped the worst of events in New York. He walked 100 blocks to get home on Tuesday, a distance of four or five miles. New York City has been shell shocked since the attack, said Jedlicka on Friday, with F-16 jets flying over the city and police and rescue workers roaming the streets. Jim O'Fallon, who lives in rural Paynesville and works for Xcel Energy, was scheduled to take a 9:06 a.m. flight to Denver on Tuesday morning for a business meeting. His row had just been called to board the plane when the second hijacked aircraft hit the World Trade Center. O'Fallon had been sitting with his back to the television, but when he stood to board the plane he saw people watching the news intensely and wondered what was so interesting. The Federal Aviation Administration grounded all flights in the United States before O'Fallon got on the plane, giving him ample opportunity to watch what was happening on television. "With all those people around, you couldn't hear what the television was saying. You could see the pictures." O'Fallon called home, much to the delight of his wife and daughter, who had heard of the attacks and were worried about his status. He wasn't alone in calling home: having to wait six deep in line for the suddenly in-demand pay phones. Flights weren't cancelled right away, and the airport filled with people waiting for flights and people stranded in Minneapolis by FAA orders for planes to land. O'Fallon first waited to see if his flight would take off after a delay and then rebooked his flight for the next morning. "The airport filled up in a hurry," said O'Fallon, "but it emptied out in a hurry, too." The most unnerving part of the experience for O'Fallon was not the planes that had already crashed in New York City and Washington, D.C., but the missing plane that eventually crashed in Pennsylvania. The whereabouts of that plane were unknown for an hour after the terrorist plot became apparent, crashing a little after 10 a.m. CDT. Reports and rumors of an imminent rise in gas prices led to a rush on gasoline on Tuesday night in Paynesville. "Big lines," reported Dave Lang of H & L Express, which ran out of gas at 10:30 p.m. on Tuesday and had to close early. H & L received a shipment of gas early Wednesday morning, and Lang reported that demand was still high but calmer that day. Panicked consumers used everything from 50-gallon drums to milk jugs to hold extra amounts of gasoline, reports from area gas stations indicate. "People panicking is what's going to cause prices to rise," Lang said. After the other gas stations closed, Hilltop Stop was besieged by gas customers. "It was just chaotic," said Shawn Evans, whose family owns the station. Evans said his teller was in tears from irate customers, that people were demanding other cars pull out as soon as they were filled, and that he lost 220 gallons ($375) in drive-offs. He blames the national media for creating the frenzy that resulted in the local gas panic. On the advice of his distributor - who could not tell what was happening with gas prices or when he could get another load - Evans raised his prices to $2.69 per gallon to try to slow down demand, he said. "Maybe people will look at the sign and think about it," said Evans of his reasoning. When gas was still going fast, they eventually raised their price to $3.69, a price which was reported on WCCO Radio on Wednesday morning by a caller. When gas prices remained low, Evans dropped his price back to $1.71 per gallon on Wednesday. A number of irate customers have contacted the business, according to Evans. Michelle Hoppe of Regal was one upset customer. She said she was mad that the business gouged the public. "Everybody else was closed and they chose that moment to raise the price on the board," she said. "And they couldn't give me an excusable reason for the price raise." Evans counters that he didn't force anyone to purchase gas. In the chaos, no one would go home and come back in the morning. "We probably should have just locked the doors. We probably should have shut off the pumps and gone home," he said. He would also ask the police to come and patrol his pumps if a situation like this surfaces again. "I've never had to deal with something like this before, and I hope I don't have to again," he said. According to the Minnesota Department of Commerce, the state's gasoline and diesel supplies, as of Sept. 7, were the highest since April. 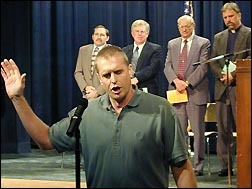 The community gathered Sunday afternoon in the school auditorium for a prayer service for America put together by the Paynesville Ministerial Association. Eleven area churches took part in a service divided into segments which recognized the victims and their families, the support people, the leaders of our country, the church, and the needs of people across the country. Luke Martinson was one of the soloists at the service. He sang "Proud to be an American."